The 2018 release of Lunar Series II coins from the Perth Mint honors the Year of the Dog. Perth’s penultimate release in the series continues the success of the Lunar collection with two stunning designs for the Year of the Dog on its silver and gold coins in the collection. If you’re buying gold, there’s no better program than Lunar Series II! 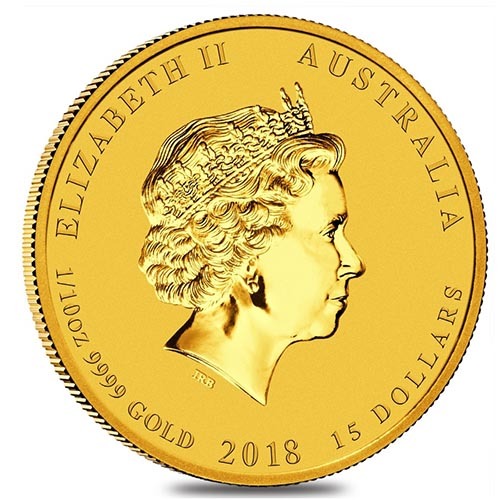 The 2018 1/10 oz Gold Australian Dog Coin is available to you online today at Silver.com. Ships to you sealed in an acrylic capsule. Eleventh image on the Lunar Series II collection! A Labrador Retriever graces the reverse side of the coin. Designed by Ing Ing Jong. Lunar Series II coins from the Perth Mint are available annually in both silver and gold, with illustrator Ing Ing Jong creating different images for the silver and gold coin programs. For this year’s release, the silver coin features two German Shepherds. These 2018 1/10 oz Gold Australian Dog coins have the image of a singular Labrador Retriever. Ing Ing Jong is an accomplished illustrator who was hired by the Perth Mint as a coin designer in 2011. Her first major endeavor with the mint has been the creation of gold and silver designs in the Lunar Series II program, a role she took on in 2013. The gold coins of the Lunar Series II release feature eight different weight options. You can purchase larger weight coins such as the 1 Kilo, 10 oz, or 2 oz coin. There’s also the traditional 1 oz gold coin, and a selection of four fractional weights. On the obverse of all Gold Australian Dog Coins is the effigy of Queen Elizabeth II. British monarchs appear on the obverse of all British and commonwealth coinage, with Queen Elizabeth II having featured since 1952. This particular design came from Ian Rank-Broadley in 1998 and is the fourth-generation depiction of Her Majesty during her long reign. 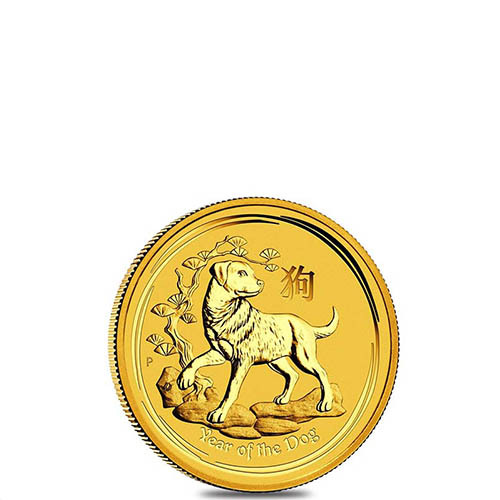 The reverse of the 2018 1/10 oz Gold Australian Dog Coin includes the image of a Labrador Retriever as it stands atop a rocky surface. A stylized pine tree rises behind it, with the Chinese character for dog above its back. 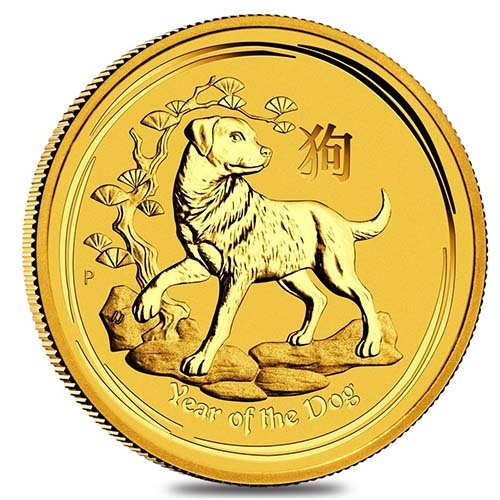 Below it is the engraving of “Year of the Dog,” and the Perth Mint’s “P” mint mark is featured to the left. We encourage all Silver.com customers to reach out to us with questions. You can reach our team of customer service associates at 888-989-7223, chat with us live online, or simply send us an email with your inquiries.